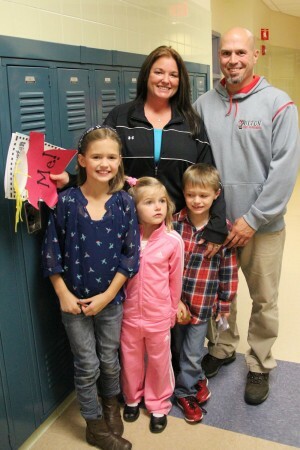 Hundreds of families turned out for the Lanigan Elementary School Open House on Tuesday. Building principal Jeff Hendrickson along with classroom teachers and the district’s Director of Literacy and UPK, Carri Waloven, were on hand to talk to parents about the Common Core Learning Standards as they apply to math, English language arts, and other subject areas along with what to expect this school year and ways to support each child’s learning at home. Pictured above during the open house are Jen and Dan Mainville and their three children who attend Lanigan Elementary School: Abby Mainville, fourth grade; Allison Mainville, kindergarten; and Andrew Mainville, first grade.